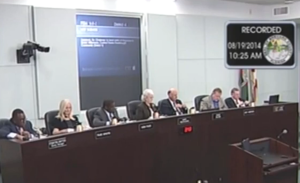 BREVARD COUNTY, Fla. — A Florida county has rejected an atheist request to be added to the rotation of those who deliver the invocation at public meetings. Instead of seeking to utilize the prayer portion of the meeting, the county suggested that Williamson’s group speak during the public comment period. But Williamson is disappointed by the decision and is now seeking legal counsel to possibly to take the matter to court. “It’s a slap in the face to be told specifically, ‘You cannot participate,'” he told local television station WESH. As previously reported, earlier this year, the U.S. Supreme Court ruled that prayers presented primarily in the name of Jesus at public meetings are not problematic as long as they do not seek to proselytize. The case had centered on invocations that are offered at town hall meetings in Greece, New York, just outside of Rochester, which are presented in Jesus’ name more often than not since the town is largely comprised of Christian and Catholic churches. But following the ruling, Dan Courtney of the Atheist Community of Rochester asked that he be allowed to present an invocation at an upcoming meeting, and was granted his request.